Home > all > Economy > PNG News > PNG Prime Minister O'Neill "Hunter and Gatherer"
PNG Prime Minister O'Neill "Hunter and Gatherer"
The Member for Moresby North-West, Sir Mekere Morauta, said today that the Prime Minister’s mismanagement of the economy and public finances has turned Papua New Guinea into a state of “hunting and gathering”, living daily from hand to mouth. It has been reported that the trip will cost almost 7 million Kina – at a time when hospitals and health centres are short of medicine; schools, even in Port Moresby, are closing; small Papua New Guinean businesses are waiting to be paid their bills by the Government; and retired public servants are waiting for their superannuation entitlements, some dying before their entitlements have been paid. This Prime Minister has no sense of responsibility or fairness. The trip also comes at a time when the Prime Minister’s own province, and Hela, are in turmoil. For the first time in the nation’s history an aeroplane has been highjacked and burned, and civil unrest continues. The Prime Minister is happy to send soldiers and policemen to face his people who are up in arms, yet he runs away. Sir Mekere said Mr O’Neill should take personal responsibility for the chaos in the Southern Highlands, which stems from the chaos of last year’s national election. “The anomalies in voting and counting in all the seats in his province are the underlying cause of the current problem,” he said. “Put the ongoing landowner issues stemming from his government not paying monies due from the LNG project, his government’s refusal to deal with the proliferation of weapons throughout the country, and the recent earthquake on top of the election issues, and you have a situation packed with dynamite. “The Prime Minister inflamed the situation in the province by announcing he had suspended the provincial government. He announced he had appointed an Acting Administrator and that he would ‘personally’ oversee the operations of the suspended Government on behalf of the National Executive Council. He has now woken up to the fact that neither he nor NEC has the power to suspend the provincial government and is blaming the media for misreporting him. “But the media reports came from an official statement from his own office. Why blame the media? Take responsibility for mismanaging the problem and your province yourself, PM. “Instead of facing the problems in his own backyard and dealing with the causes of the problems, the Prime Minister runs to China on the biggest begging trip ever – 93 people in the delegation, including 50 Chinese, according to the official list. What on earth are they all going for? To negotiate our becoming a colony of China? Is PM leading a delegation of Papua New Guineans or a delegation of Chinese? 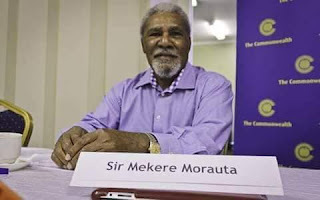 Sir Mekere said Papua New Guinea is rich in natural resources. “Our problem is that we seem to be unable to manage prosperity, or to distribute the real benefits equitably amongst people and regions,” he said. “Our problem is the Prime Minister. The longer he stays the further he undermines the inherent strength that the natural resources provide.